Many runners are familiar with common electrolytes like sodium, potassium, magnesium and calcium. These minerals, namely sodium and potassium, play a role in helping to maintain fluid balance while exercising. Essentially, they allow your muscles and nerves to continue contracting optimally. Since we lose electrolytes along with water in our sweat, we need to make sure we are consuming an adequate amount to stay properly hydrated. Having sufficient electrolytes on board can help prevent dehydration and muscle cramps, as well as aid in cognitive function and performance. Staying properly hydrated is even more important in the summer months, when we tend to lose more water and electrolytes in sweat. Most runners are more concerned with low sodium levels than with higher ones. Hyponatremia, a dangerously low concentration of sodium in the blood, usually occurs when there is an excess of water (fluid) in relation to sodium in the body. Exercise-associated hyponatremia (EAH) can develop during or after physical activity (usually in regards to intense or endurance-type activities) and can lead to serious consequences. Potassium works with sodium and is specifically recognized for its help in aiding muscle contractions, maintaining blood pressure and preventing muscle cramping. The daily recommendation for potassium intake is about 4700 milligrams. While many of us rush to consume electrolytes through sports beverages, gels, tabs and other supplements, we often forget that many delicious foods contain electrolytes, as well. Furthermore, many of the standard sports drinks and energy bars may contain sodium but lack other important electrolytes, and may also contain unwanted ingredients or added sugars. According to this study published in Nutrients, hydrating foods can contribute about 20 percent of our water intake. Generally speaking, raw fruits and vegetables have the highest water content among all foods, and many offer small electrolyte content, as well. As a further bonus, these foods also offer carbohydrates, which are essential for recovery and replenishing lost muscle glycogen stores—providing even more reason to get your five servings each day. While there’s no one magic food, adding a variety of electrolyte-rich foods to your diet throughout the day can help with hydration, recovery and performance. Here are some of our favorite in-season summer foods that you may find at your local farmer’s market and can add to your meals and snacks to help improve your electrolyte levels. Strawberries are known for their antioxidant vitamin C content, but they also contain potassium. One serving of strawberries offers about 5 percent of your daily potassium needs. Throw them in a smoothie, add them to your oatmeal or just eat them as-is! Tart cherries are beneficial to runners for many reasons. While there is emerging research about their role in reducing muscle pain, inflammation and improving recovery, tart cherries are also a source of many essential nutrients and electrolytes. One cup of cherries offers between 270 and 300mg of potassium, as well as small amounts of calcium, magnesium and sodium. Runners’ beloved bananas are a great source of potassium, offering 422mg per medium-sized banana in addition to small amounts of magnesium. Add some salted peanut butter or salted nuts to your post-workout banana snack to increase your sodium content, boost your hydration and hasten your recovery. Tropical fruits like mangoes, pineapples and apricots are also very high in vitamin C, antioxidants and electrolytes. One cup of diced mango offers nearly 7 percent of your daily potassium needs, as well as small amounts of magnesium. Try throwing it in a smoothie with some milk or yogurt to add extra electrolytes to your post-workout fuel. 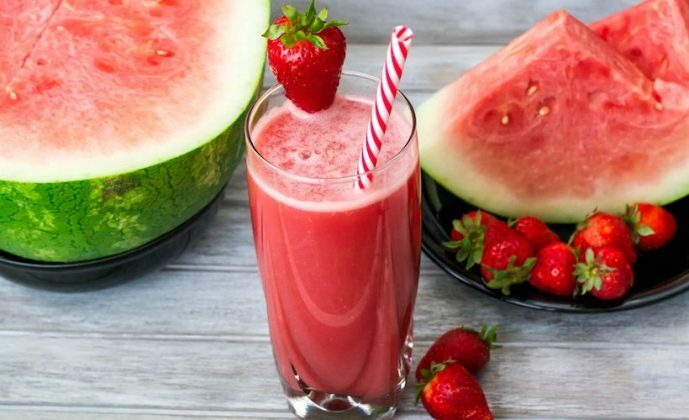 While watermelon may be 92 percent water, this fruit also offers some potassium to fight muscle cramps, as well as antioxidants like vitamins A and C. Add some salt to simultaneously enhance the juiciness and increase your sodium levels.